"Sony will cut costs, raise production yields for new offerings and increase sales of image sensors used in automobiles. The moves aim to shield the semiconductor business from highly volatile smartphone demand. Sony holds the leading global market share of nearly 50% in value terms for image sensors, Techno Systems Research says. But competition from No. 2 Samsung Electronics and others is growing." TSR appears to be quite optimistic in its estimation of Sony share. Other analysts give Sony "only" 35-40% of the market. Albert Theuwissen continues his review of IISW 2017. Day 2 part talks about Quantum Jot pixel advances, SPADs, ToF, HDR sensors, and more. Also, Albert has announced the subject of 5th Harvest Imaging Forum to be held in on December 7-8 and 11-12 "Low-Noise Analog CMOS Circuit Design: from devices to circuits." Phys.org, ICFO: Barcelona, Spain-based Institute of Photonic Sciences in collaboration with the company Graphenea develops "a high-resolution image sensor consisting of hundreds of thousands of photodetectors based on graphene and quantum dots (QD). They operated it as a digital camera that is highly sensitive to UV, visible and infrared light at the same time. This has never been achieved before with existing imaging sensors." The paper "Broadband image sensor array based on graphene–CMOS integration" by Stijn Goossens, Gabriele Navickaite, Carles Monasterio, Shuchi Gupta, Juan José Piqueras, Raúl Pérez, Gregory Burwell, Ivan Nikitskiy, Tania Lasanta, Teresa Galán, Eric Puma, Alba Centeno, Amaia Pesquera, Amaia Zurutuza, Gerasimos Konstantatos & Frank Koppens has been published in Nature and appears to be a version of the previously published one. OSA Optics Express publishes Microsoft and HRL Labs open-access paper "Highly curved image sensors: a practical approach for improved optical performance" by Brian Guenter, Neel Joshi, Richard Stoakley, Andrew Keefe, Kevin Geary, Ryan Freeman, Jake Hundley, Pamela Patterson, David Hammon, Guillermo Herrera, Elena Sherman, Andrew Nowak, Randall Schubert, Peter Brewer, Louis Yang, Russell Mott, and Geoff McKnight. Form the abstract"
"The significant optical and size benefits of using a curved focal surface for imaging systems have been well studied yet never brought to market for lack of a high-quality, mass-producible, curved image sensor. In this work we demonstrate that commercial silicon CMOS image sensors can be thinned and formed into accurate, highly curved optical surfaces with undiminished functionality. We demonstrate these curved sensors in prototype cameras with custom lenses, measuring exceptional resolution of 3220 line-widths per picture height at an aperture of f/1.2 and nearly 100% relative illumination across the field. 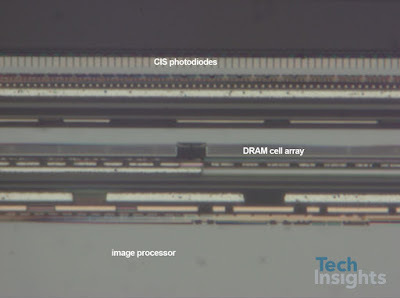 Though we use a 1/2.3” format image sensor in this report, we also show this process is generally compatible with many state of the art imaging sensor formats. By example, we report photogrammetry test data for an APS-C sized silicon die formed to a 30° subtended spherical angle. These gains in sharpness and relative illumination enable a new generation of ultra-high performance, manufacturable, digital imaging systems for scientific, industrial, and artistic use." Albert Theuwissen publishes his review from International Image Sensor Workshop 2017 being held these days in Hiroshima, Japan. Day one part talks about Sony stacking progress, TSMC-Qualcomm vision sensor project, Omnivision re-igniting pixel size race, and more. David Stoppa, the head of image sensor group at FBK and renown SPAD expert, has left FBK and joined AMS-Heptagon. Now, Heptagon gets a lot of knowledge and expertise in direct ToF sensors, in addition to the indirect one that it acquired with MESA Imaging few years ago. Backchannel, RoadToVR: The secretive AR startup Magic Leap is in the process of raising D round money at the company valuation of $6–8 billion, reportedly. Chinese Alibaba is said to be leading the new funding round. Just 15 months ago, Magic Leap raised $793.5M, adding to the $592M it had previously raised and earning a valuation at $4.5 billion. "...solution is to use silicon germanium in place of elemental silicon for the semiconductor layer. Silicon germanium has a lower bandgap than elemental silicon, such that it is better for the absorption of infrared radiation. However, silicon germanium has poor compatibility with CMOS processes for the logic devices due to increased leakage current. 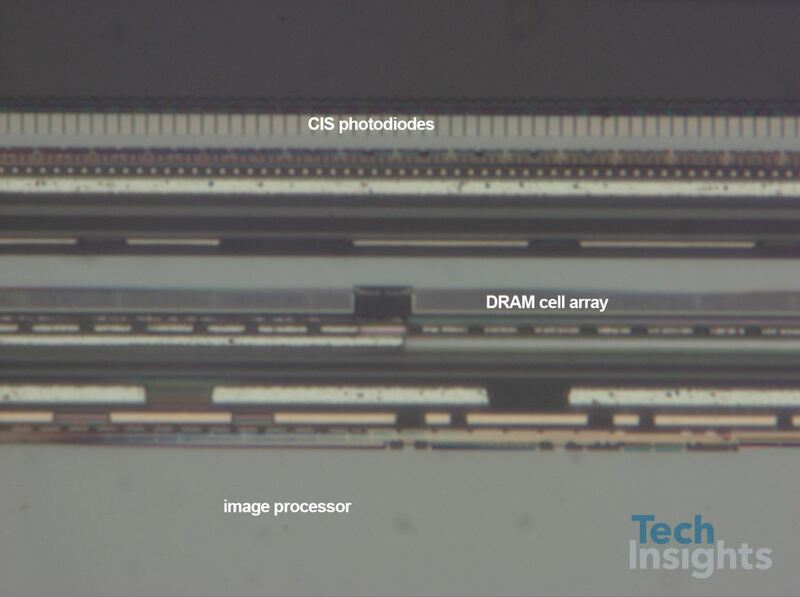 As such, manufacturing the logic devices on silicon germanium introduces difficulties and adds cost to the manufacture of the CMOS image sensors. The present application is directed to a CMOS image sensor with elemental silicon and silicon germanium for long-wavelength pixel sensors. In some embodiments, an elemental silicon layer abuts a silicon germanium layer. A photodetector is at least partially buried in the silicon germanium layer and a transistor is arranged on a surface of the elemental silicon layer with a source/drain region electrically coupled to the photodetector. By arranging the photodetector in the silicon germanium layer, the photodetector advantageously has good sensitivity to and absorption of long-wavelength radiation, such as, for example, infrared radiation. Further, by arranging the transistor on the elemental silicon layer, conventional CMOS processes may advantageously be used when forming the transistor." "...the semiconductor stack 102 comprises a silicon layer 104 and a silicon germanium layer 106. In some embodiments, the silicon germanium layer 106 partially covers an upper surface 108 of the silicon layer 104, and/or is buried in the upper surface 108 of the silicon layer 104. In other embodiments, the silicon germanium layer 106 is partially or fully covered by the silicon layer 104. The silicon and silicon germanium layers 104, 106 may correspond to epitaxial layers and/or regions of a semiconductor substrate, and the silicon layer 104 may be, for example, elemental silicon." "The infrared sensor component includes a substrate , a III-V compound layer  disposed on the substrate as an active pixel region, and a plurality of transistors formed on the III-V compound layer. The III-V compound layer is made of III-V groups materials, which have wide infrared wavelength coverage, large absorption coefficient in the infrared region, and high carrier mobility. Therefore, the performance of the infrared image sensor component can be improved accordingly." Marketwired: For more than 35 years, Teledyne DALSA has designed and manufactured what it calls the machine vision industry's best-in-class line-scan image sensors. Used in the company's line scan cameras, this class of sensors these sensors were not available as stand alone products. Now, DALSA has decided to offer them for sale, available immediately in resolutions from 2k to 16k. 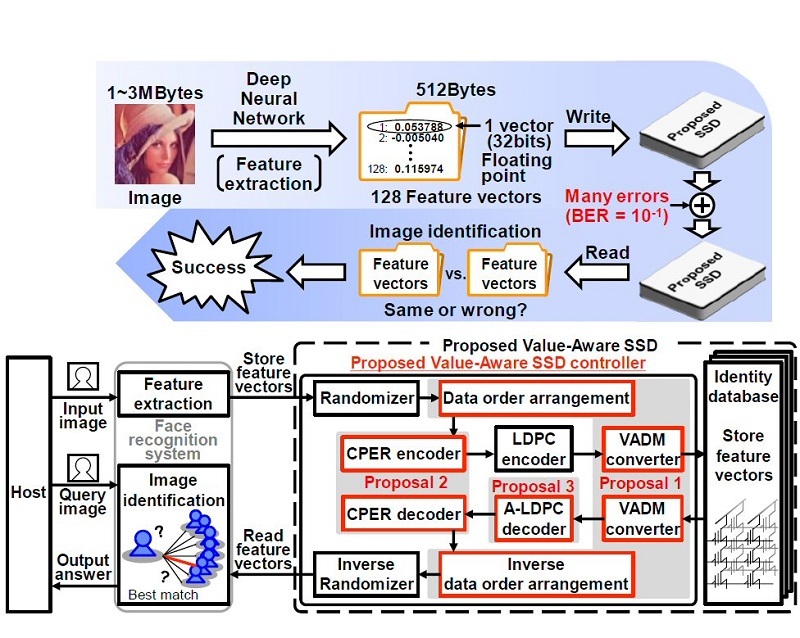 Nikkei: Prof. Ken Takeuchi group at Chuo University, Japan, proposes "Value-Aware SSD" that evaluates the value of image data and stores important and not-so-important data in high- and low-reliability flash memory cells, respectively. 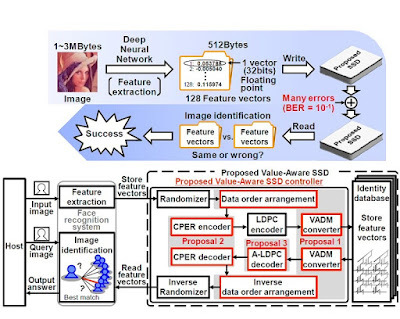 With that, it became possible to implement high-accuracy face recognition even when the error rate is 10%, which is 12 times higher than in existing SSDs. The data retention time of SSD was improved 300 times. In addition, the read speed was improved by 26% by minimizing the time it takes to correct memory errors. Sony has held a Corporate Strategy Meeting as a part of its IR Day discussing the business growth strategy and fiscal targets. Regarding the image sensor business, the company looks for "the image sensor for mobile use business to recover." PRNewswire: OmniVision introduces the 1.3MP OX1A10 and 1.7MP OX2A10 for side- and rear-view camera monitoring systems (CMS), respectively. Built on 4.2um BSI split pixel technology for HDR, the new sensors offer LED flicker–reduction. "In regular HDR cameras, the short exposure time causes the image sensor to miss the LED 'on' pulse, giving the appearance of 'flicker' in the video stream on a display. Merely increasing the exposure time of normal pixel technology to capture the LED pulse does not solve the problem, but rather causes saturation and loss of dynamic range," said Marius Evensen, product marketing manager at OmniVision. "We designed the OX1A10 and OX2A10 image sensors with LED flicker–reduction technology to specifically mitigate this problem and enable mass adoption of e-mirrors in the automotive market. These sensors join our growing portfolio of automotive specific digital imaging solutions targeted at both machine and vision display systems." The OX1A10 and OX2A10 achieve 110dB HDR while guaranteeing LED pulse capture. The OX1A10 supports 1280 × 1080 resolution in a 1:1.2 aspect ratio for side-view cameras. Targeting rear-view cameras, the OX2A10 supports 1840 × 940 resolution in a 2:1 aspect ratio. The sensors' on-chip combination algorithm reduces the output data rate for easier data transition and back-end processing. The OX1A10 and OX2A10 are currently in volume production. PRNewswire: OmniVision announces the OV493, a companion chip with surround-video image-processing capabilities for automotive applications. Each OV493 can process two video streams simultaneously, and two ISP companion chips can process four camera inputs for surround-view applications. "As advanced automotive driver-assistance features, such as 360-degree surround-view systems, become more popular, automotive manufacturers seek imaging solutions that are suitable for multiple vehicle platforms and can meet stringent industry standards," said Andy Hanvey, senior automotive marketing manager at OmniVision. "The OV493 gives Tier-1 OEMs an opportunity to reduce system cost, maintain high performance, and design distributed architectures for multiple driver-assistance systems." PRNewswire: OmniVision introduced the OV2311, an automotive 2MP, 3um global shutter IR-enhanced image sensor for driver monitoring systems. To combat distracted driving, the automotive industry is ramping up its development of driver monitoring systems and vehicle co-pilot applications, which in combination can allow the on-board computer to seize or relinquish control of the vehicle, based on the driver's state. NHTSA defines this setup as level 3 autonomy. Currently only available for luxury vehicles, these systems are expected to become a standard safety feature in the near future. "The demand for driver monitoring systems is expected to increase significantly as more affordable technologies allow advanced semi-automated features to transition from high-end to mainstream vehicles," said Jeff Morin, automotive product marketing manager at OmniVision. "Possessing the same capability customarily found in much larger and more expensive sensors, the OV2311 aims to bring advanced driver monitoring systems to the masses by delivering high-level, cost-effective performance in a compact form factor." Vision-based driver monitoring systems in semi-autonomous vehicles require highly sophisticated eye-tracking technology and imaging capabilities. The OV2311 achieves high NIR QE to minimize active illumination power. The OV2311 is available for sampling, with volume production expected in Q4 2017. PRNewswire: Softkinetic announces that BMW extended use of its ToF camera for gesture control in its Series 5 cars, in addition to the last year's Series 7. "SoftKinetic is proud to expand our technology partnership with BMW Group to include both the BMW 7 and BMW 5 series cars," said Eric Krzeslo, CMO of SoftKinetic. "The infotainment gesture control we see in the BMW cars is just the beginning of the innovation we are bringing to the automotive market. Our technology can improve driver safety through driver assistance and monitoring and 3D vision cameras that ascertain the environment in and out of the vehicle at all times paving the way towards the fully autonomous vehicle." Intel keeps investing in its vision-based solution and capabilities. 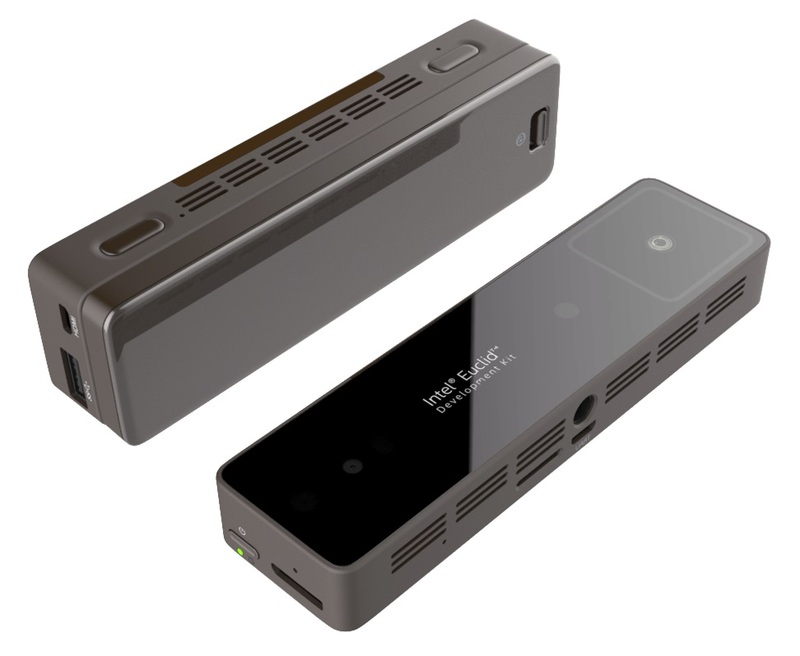 The recently announced Euclid Development Kit is a fully stand-alone computer integrating RealSense IR stereo depth camera, a fish eye camera, an RGB camera, an Atom x7-Z8700 Quad core CPU, microphone, GPS, WiFi, and Bluetooth to produce a compact all-in-one computer and depth camera in the size of a candy bar. It comes with a 2000mAh battery so it is completely stand alone. Thanks to AM for the link! “The company is talks with some global clients to commercialize the fingerprint tech in the whole area of a smartwatch screen and a certain part of a smartphone display,” a CrucialTec official said. The newly patented technology is said to feature three thin film transistors for each electrode to pick up high-resolution images, compared to one for each electrode in the existing fingerprint scanner. That configuration is said to maximize the sensing capability while maintaining high transparency level of the components. 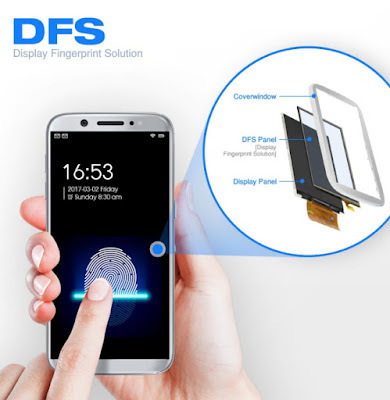 MobileIDWorld, BiometricUpdate: In-display fingerprint sensing solutions are gathering quite a lot of attention recently. Goodix presented its solution at MWC in Barcelona this year. Synaptics and OXi Technology have been reported developing a similar technology some time ago. Apple is rumored to integrate a similar sensor in its future iPhone displays.